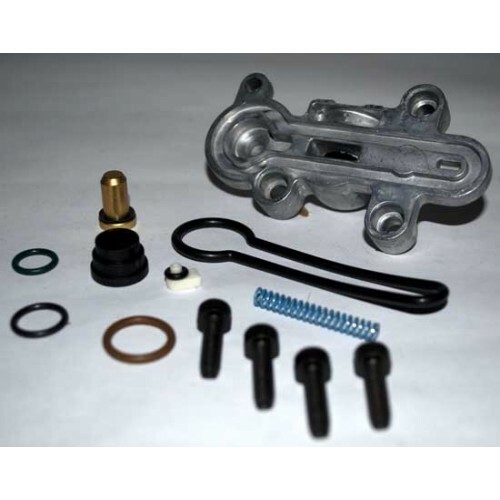 This “BLUE SPRING UPGRADE” is a oem part (#3C3Z-9T517-AG) Fuel pressure regulator update kit. This kit is an upgrade that can increase fuel pressure in most 6.0 liters from10-12 psi of fuel pressure. This Upgrade will keep the injectors from out flowing the factory fuel pump and sending air to the injectors during wide open throttle. This means longer injector life and better performance. Most 6 liters will be quieter during idle after the “Blue Spring” and tend to be more fuel efficient. This kit will come with all parts need to rebuild a 6.0 liter fuel pressure regulator. This kit is a simple install should take around a half hour to install.